Fucked Up are releasing the next 12″ in their Chinese Zodiac series on September 27th. 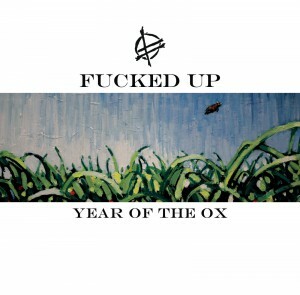 Being released on Merge in North America and Matador everywhere else, ‘Year of the Ox’ continues in the trend of these releases and clocks in at 13 minutes long. It also features guest appearances from Nika Roza Danilova (Zola Jesus) and Torontian string quartet New Strings Old Puppets. You can hear the track in it’s entirety right now over on Pitchfork. The band are in Europe now and play London tomorrow where they headline the 1234 Festival before moving on to play the Truck Festival in Oxford. There might also be a secret show inbetween. After playing Russia at the end of July, they’ll return to the UK on August 6th for three festival shows (Standon Calling, Hevy Festival and Rebellion), finishing up with a headline show at The Hoxton Bar & Grill on August 9th (support comes from Trash Talk). Wonder when the preoder goes up at Merge? Can’t wait to see guys at Matador 21!!!! Previous Previous post: Casual Victim Pile – Where Are They Now?